Yesterday, (Saturday 30 May) Widnes Vikings presented Sir Bobby Robson’s son, Andrew Robson, with a cheque for £20,000 for the Sir Bobby Robson Foundation on the pitch at St James’ Park. The money donated to the Foundation is the result of a Widnes Vikings initiative that has generated global attention both for the sport of Rugby League and the work undertaken by the Sir Bobby Robson Foundation. Earlier this year Widnes Vikings launched a special edition black and white striped shirt for the First Utility Super League Magic Weekend fixture with Vikings Ambassador and football legend, Peter Beardsley, at Walker Technology College. Yesterday, the Vikings players took to the field in Newcastle wearing the striped jersey bearing the prominent Sir Bobby Robson Foundation logo. This initiative is the brainchild of Vikings football-mad Marketing Director Brian O’Connor. He decided early in the Magic Weekend planning that the Vikings could do much more in the North East to raise the profile of rugby league and to engage the local people than turn up and play a one-off fixture. Thanks to the Vikings principal sponsor The Parcel Centre, who kindly agreed to vacate their sponsorship space on the front of the Vikings Super League playing kit, O’Connor was able to design a special edition black and white shirt with kit manufacturer O’Neills featuring the Sir Bobby Robson Foundation logo front and centre of the shirt. The Vikings ordinarily play in a black and white hooped jersey. Yesterday, they paid homage to Magic Weekend hosts Newcastle United, their faithful supporters, and local hero Sir Bobby Robson, in the special edition striped shirt. They did so in front of a packed crowd awash with black and white stripes worn by a combination of passionate travelling supporters and local sports fans that had adopted Widnes Vikings as their second team. Brian O’Connor explained: “Our club has a very strong black and white heritage. At the outset this initiative was about tying our colours in with the famous black and white stripes of our Magic Weekend hosts. “As a small club in the First Utility Super League we have to work harder than some of our competitors to make sure that the Widnes Vikings brand is prominent in people’s minds. “We wanted to do something to make our mark in the North East and to leave a lasting legacy both for Widnes Vikings and the sport of Rugby League. Sir Bobby’s son, Andrew Robson said today: “It’s been an absolute pleasure working with Widnes Vikings. 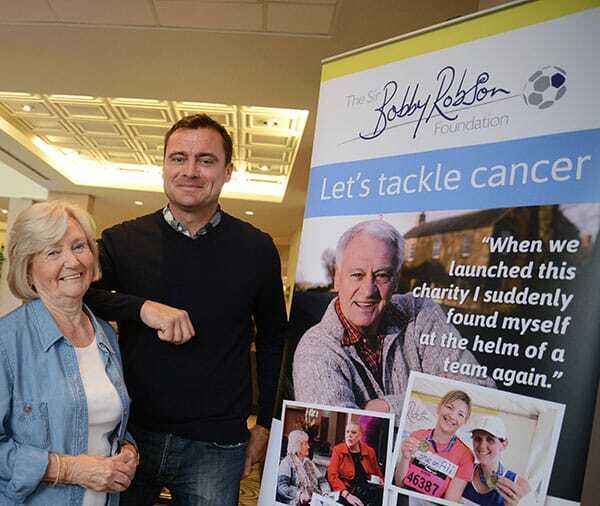 “The support the Sir Bobby Robson Foundation has received from the club and its fans has been outstanding. “To see the players and fans in black and white stripes, here at St James’ Park, was very special. Watching rugby league here has been a new experience for me and something I’ve enjoyed a great deal. “Our thanks to everyone who has supported our cancer charity by buying a Widnes Vikings Magic Weekend shirt. In recent weeks Widnes Vikings’ initiative for the Sir Bobby Robson has generated phenomenal interest on a global scale. The shirt has been endorsed by a number of high-profile celebrities including Halton stars John Bishop and Melanie C, comedian Paddy McGuinness, TV personalities Tim Lovejoy, Simon Rimmer and the cast of Hollyoaks, rugby player Sam Burgess and footballers Dietmar Hamann, Rob Lee, John Beresford and Newcastle United Legend Alan Shearer. Through their public support for the shirt on social media more than 10,000,000 followers have been exposed to this initiative. 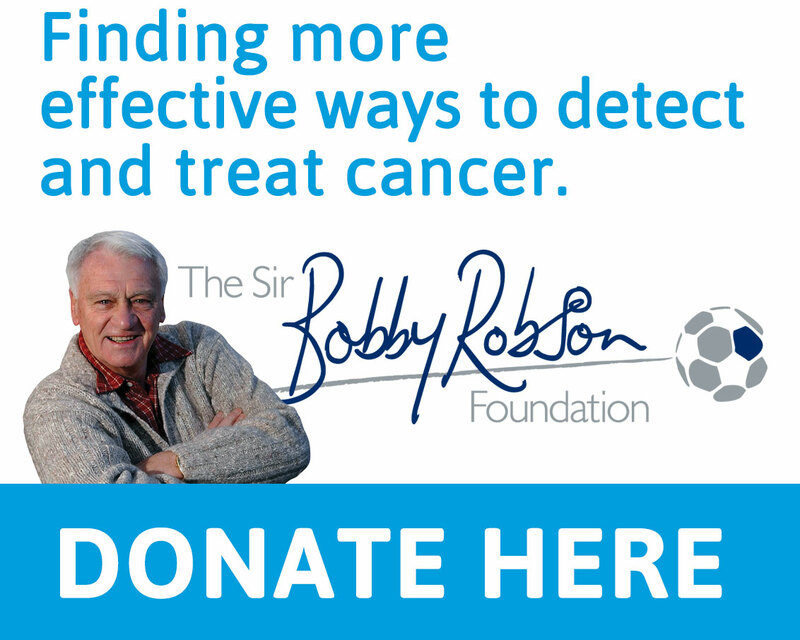 100% of the profits from Magic Weekend shirt sales have been donated to the Sir Bobby Robson Foundation. In addition to raising valuable funds through this initiative, the Vikings have also used the Magic Weekend shirt as a vehicle to promote rugby league in the North East. The club has delivered community Rugby League programmes to more than 800 local children at local community club Cramlington Rockets and Walker Technology College. Cramlington Rockets chairman Jeff Ball commented: “We have been really impressed with Widnes Vikings’ efforts to promote rugby league in the North East. Derek Twigg MP has submitted a request on behalf of Widnes Vikings to the Chancellor of the Exchequer, The Rt Hon George Osbourne for tax on the shirt to be waived to ensure that the Sir Bobby Robson Foundation receives the maximum amount of money for this initiative.